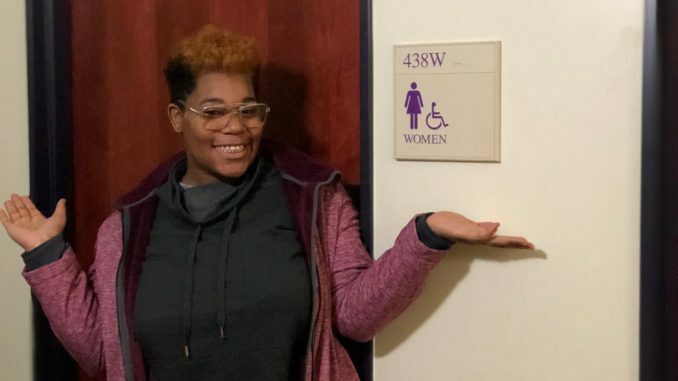 Last year, Student Senator Jasmine Maddox, a junior from Atlanta, noticed what she considered an important object missing in women’s communal bathrooms. There were no menstruation product trash cans in any residence hall. In communal bathroom halls, like Seaton and Wesley, only one large trash can was provided in each shared bathroom. In suite-style Mitchell Towers and Whitehouse, each floor bathroom — not each suite’s private bathrooms — also had only one large trash can available for women. The halls in Seaton and Wesley were switched over the summer from male to female, meaning that the current female halls in each building were male halls earlier this year. After the halls were switched, no receptacle trash cans for hygiene products were installed in the new women’s bathrooms. Not only do the trash cans help deter hygiene products from being flushed, they help students dispose of those products without being ridiculed. Maddox said that the menstrual cycle is both personal and exhausting. The trash cans help students feel comfortable when disposing their products, like pads and tampons. Maddox contacted Trista Geier, now-acting director and associate director of Residential Life, in September 2018 about the issue. The two worked together, and over winter break, Facilities Operations ordered about 30 brand new trash cans for Seaton and Wesley Halls. The trash cans were split between the two residential halls and were distributed to all their communal women’s bathrooms. Facilities has also ordered more trash cans to be put in place in the public floor bathrooms of Whitehouse and Mitchell over spring break. She said students of Albion are continually advocating for minority and gender accessibility on campus. Small installments brought upon by these students, like menstruation trash cans, make a large impact on the student population. Geier said part of Residential Life’s goal is to work with students in order to make the Albion experience as great as it can be. The installment gave Residential Life a great opportunity to communicate, collaborate on and accomplish important tasks with Albion students for Albion students. “For me, in my perspective as associate director of this department, it was about establishing very positive communication patterns and how we work with students,” said Geier. Residential Life plans on continuing their accessibility efforts with students in order to make the campus and student life as accessible and enjoyable as possible.